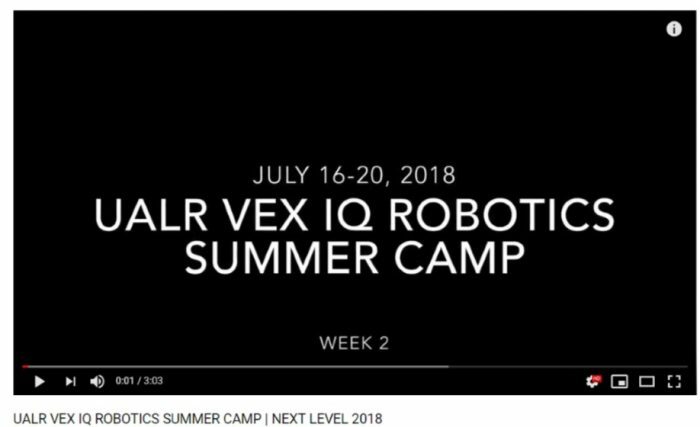 We are excited to offer 6 VEX camps for Summer 2019! All camps are M-T-W-Th-F, half-days, either in the morning (8:30-11:30 am) or afternoons (1-4 pm). The cost for each camp is $175 and includes a t-shirt and snacks. To ensure effective student-to-instructor ratios, camps will be limited to 20 students each – no exceptions. All camps will feature competition on Friday, which family and friends are welcome to attend! Click the video link for a recap of last summer! This camp will be centered around the VEX IQ robotics kit used by many schools in Arkansas. This camp will focus on introducing students to VEX IQ robotics components, programming methods, and construction techniques. This camp is open to all rising 3rd-8th grade students. The purpose of VEX Girl Powered is to encourage new experiences, a diverse culture, and a more encompassing definition of what a roboticist looks like. In an effort to encourage more middle school/high school girls into robotics, we are providing a girls-only session. The camp will offer the same skills as Session 4 and is open to rising 6th-12th grade girls. Explore the worlds of engineering, robotics, and coding with the VEX Robotics Design System. Get hands-on experience building a frame and base for the robot and engineer its wiring. Teams must adapt their robots to compete in user-piloted challenges and obstacle courses as well as autonomous robot challenges requiring programming using the ROBOTC software. This camp is open to rising 6th-12th grade boys and girls. This camp is for students already familiar with VEX IQ robotics, either through their school, last year’s camp, or by attending Sessions 1 or 2. This camp will focus on advanced building and programming strategies, including the use of sensors. This camp is open to all rising 3rd-8th grade students.